Star brite® worked with the world’s leading formulators of coolant additives to develop a product that significantly outperforms traditional coolants and helps engines develop maximum horsepower. Star Cool® combines an essentially non-toxic propylene glycol base with unique poly organic additives (POAT) to create the most technologically advanced engine coolant. Star Cool® is the best choice for all high-performance engines. With a service life of up to 2+ years, 250,000 miles or 4,000 hours in gasoline engines (750,000 miles, 7+ years or 12,500 hours in diesel engines) it goes significantly beyond all OEM specifications. Star Cool® passivates metal surfaces to create a barrier to corrosion and will seal pinhole leaks or small cracks. Pre-mixed with de-ionized water, it is ready to use and safe for all water-cooled gas or diesel-powered engines. Star Cool® is ideal for year-round use; protecting against boilover to 265°F and freezing to -26°F (with 15 psi cap). Do not remove radiator cap if hot. Refer to Manufacturer’s Engine Service Manual for flushing and filling DIRECTIONS 1. If none are available: 1. Check cooling system for leaks, loose connections or worn parts. 2. Remove radiator cap, open radiator and engine block drains, then flush system completely with clean water. 3. Close radiator and engine block drains when all water is drained out of system. 4. 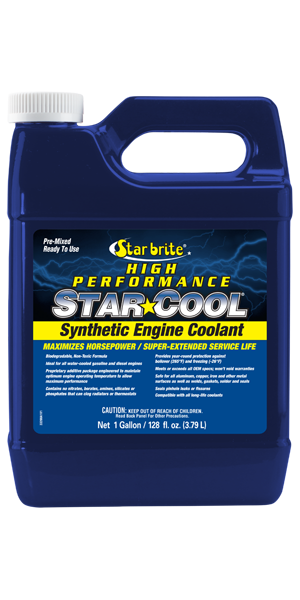 Fill system with Star brite® Star Cool® Synthetic Engine Coolant. DO NOT ADD WATER. Make sure that the level is slightly lower than the filler neck. 5. Run the engine for 5-10 minutes to reach normal temperature; the thermostat should now open, releasing any trapped air. If necessary, add more solution to fill radiator. 6. Finally, replace radiator cap and check for any leaks.